The Toronto Blue Jays complete their two-game exhibition series against the Milwaukee Brewers in Montreal on Tuesday night before opening their 2019 season at home on Thursday against the Detroit Tigers. TSN Baseball Reporter Scott Mitchell checks in with news and notes on the Jays. MONTREAL — The exact timeline is still unknown, but Vladimir Guerrero Jr. is progressing “ahead of schedule” in Toronto Blue Jays manager Charlie Montoyo’s mind. 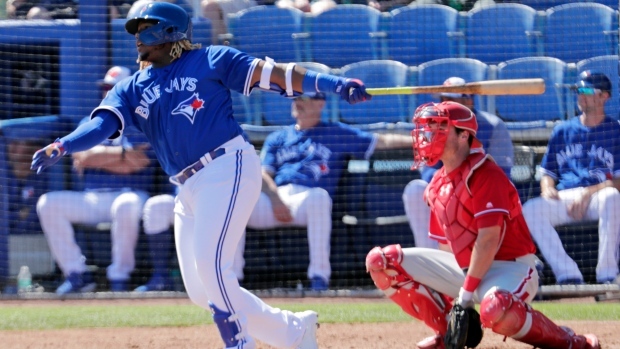 Out since March 8 when he suffered a Grade 1 left oblique strain on a swing in Grapefruit League play, Vladdy Jr. has begun swinging a bat in the cage down in Dunedin. Now close to the three-week shutdown timeline the club originally gave, Montoyo said Tuesday in Montreal that the prized prospect will be working in extended spring training at the team complex for the time being, before heading to Triple-A Buffalo. With the weather in upstate New York in April always a concern, there was some thought that the Jays would let him start his rehab games with High-A Dunedin, but Montoyo seemed to indicate that’s not the case. “Get a couple of games in extended and stuff, and then send him to Buffalo, to the 20-degree weather,” Montoyo said with a grin. No matter when, exactly, he arrives back in Triple-A, where he finished up slaughtering minor-league pitching last season, it’s good news on the Guerrero front, even if it’s only a loose timeline for an actual return. After posting a gaudy 1.073 OPS across four levels in 2018, Guerrero had a quiet spring with just four hits — and no homers — in 19 at-bats, before his spring was put on hold by the oblique, a notoriously nagging injury for a hitter due to the rotational aspect. While Montoyo feels like his future bread-butterer is ahead of schedule, you can bet the Blue Jays front office will make sure Guerrero isn’t rushed back into game action. With April now essentially Guerrero’s March, his expected mid-April arrival date has been pushed back, but exactly when the top prospect in all of baseball arrives in Toronto is still completely up in the air. With Ryan Borucki’s elbow barking, the Jays needed another starter for at least the first turn through the rotation, and Montoyo announced Tuesday that it would be Trent Thornton getting a chance to impress. Acquired over the winter from the Houston Astros in exchange for infielder Aledmys Diaz, Thornton finished the spring with a 4.80 ERA across 15 innings, but it was final outing against the New York Yankees on Saturday that won him the job. It may only be a cameo for the 25-year-old right-hander. Borucki played catch in Florida on Tuesday, and the club is optimistic he’s trending towards an early-season return. “He feels like he’s already turned the corner, so now we’ll put him on a little bit of a plan to get him back as soon as possible,” Jays pitching coach Pete Walker said. After thinking he’d only miss one start, Montoyo allowed they make take the cautious route with Borucki, who has a history of left elbow issues, including Tommy John surgery in 2013. “I’m going to guess, a young guy like that, probably two starts would be my guess,” Montoyo said. Alongside Borucki, veteran right-hander Clay Buchholz is also trending towards a mid-April return, which could mean Thornton and veteran lefty Clayton Richard will have competition for their rotation spots in the near future. Rather than shift to the bullpen, Thornton would likely be sent to Triple-A Buffalo to continue working as a starter, but a lot could happen between now and then, as we’ve seen over the past couple of weeks with arms going down in bunches. The reason Thornton is slotting in ahead of Richard in the rotation is simply because Montoyo likes the matchups. “Detroit’s more right-hander heavy, and the Orioles are not, so that’s why we’re doing it that way,” the first-year manager said. As Jays’ decision-makers scour the waiver wire over the next couple of days to see if any options cut loose across baseball are more intriguing than the ones already on hand, the bullpen is starting to come into focus. Ken Giles, Tim Mayza, Joe Biagini, and the recently-signed Daniel Hudson were already locks, with Montoyo adding Sam Gaviglio’s name to that list Tuesday. Gaviglio, who was competing to stay in the rotation for the time being, will serve as the long man, leaving “two or three” spots still up for grabs. Veteran right-hander Bud Norris is one potential option, but his late start to spring could keep him off the opening day roster. Danny Barnes, Justin Shafer, Jason Adams, Javy Guerra and Thomas Pannone are also options. One of the toughest decisions is whether to keep 19-year-old Rule 5 pick Elvis Luciano, who looked exactly like an exciting yet inconsistent teenager Monday in Montreal, plunking tough Milwaukee Brewers leadoff hitter Lorenzo Cain with the first pitch he threw, but bouncing back to get 2018 NL MVP Christian Yelich to swing through a nasty changeup for a strikeout. Right-hander Ryan Tepera, who got good news over the weekend when he had his ailing elbow checked out, played catch Tuesday.